Why mash your joints on concrete when open forests beacon? Why run in car fumes when open hillside cleanses your body and soul? Why not take a hobby like running and fuse it with the outdoors? ….. Boff Whalley makes an entertaining and valid argument for exactly this! 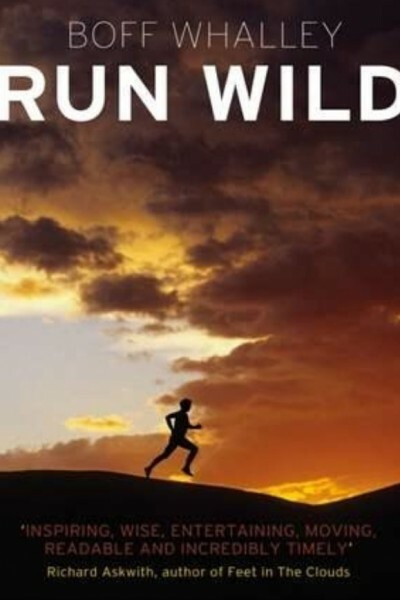 Run Wild by Boff Whalley is many things: it is a revolutionary blueprint for outdoor fitness, it is a thesis on trail running as a vehicle for reconnection to nature and it is an obituary for the modern marathon. Captivating and persuasive, Run Wild takes all those small voices of dissent every runner tries to ignore and embraces them in an attempt to get the reader to consider an alternative running philosophy. A simple and pure philosophy that inspires people to explore the Wild with a childlike sense of adventure and enthusiasm. Whalley’s central message comes as a breath of fresh air. Having completed 3 marathons in the past two years along with a host of other road races the pace of the concrete treadmill becomes burdensome and the natural high of running can be muted under a sea of rigid training programmes, guilt at not sticking to them and a constant battle against the clock. Slapping tarmac without spring in either the step or the soul soon becomes painful. One wonders why they are enduring this torture and hide behind playlists, deep heat and strong painkillers. Tarmac and Runkeeper are bad for the body and soul it would appear. If there is one resounding message from Run Wild it may be to embrace these voices of dissent and rethink the way in which you run: get out into the Wild away from roads and tarmac. Explore. Think. Have some fun. Wild Running is presented in the book to be superior to road running on so many levels: spiritually, intellectually, physically and visually. This is presented with an overwhelming logic and force of belief that is extremely well written. The book fizzes with original though expressed in eloquent language that viscerally seduces the reader into the beauty of wild running. The zeal of the convert is captivating and refreshing in a cynical age however Whalley’s conviction at times strays into intolerance when, for example, he berates the novelist Hariuki Muralami, who in his book “What I Talk About When I Talk About Running” admits to listening to music whilst running. ***Note for Readers*** We at Hikers Blog passionately believe in spreading ideas and good reads. Therefore we don’t stockpile books at home or anywhere else. Once a book is read it is left into a book club, on a bus, train or donated to a library. Join a revolutionary way of spreading good ideas and good vibes around with books. Embrace the free flowing book model! Boff Whalley, lead guitarist of Chumbawamba, recorded a song called "Stud Marks on the Summits", which was inspired by a chance meeting with Bill Smith (legendary fell-runner and author of Stud Marks on the Summits). Whalley took up fell running as a result. He was paraphrased as having said Smith "encapsulated the ethos of the sport – its emphasis on self-reliance and nature and its history." If anyone has a copy of this they are willing to lend out I be grateful. I took a look at the sample but both it and some of the reviews point to it possibly being a novel sized rant against marathons etc. If that is the case I'm not willing to splash cash on the thing, but if anyone wants to lend me theirs that's great. There's a copy in Ormeau Library if you have a card. For anyone into the outdoors I'd definately recommend the book.